Have you ever wondered what your favorite local chefs cook at home? What they prepare for their own family and friends? What they whip up when truly pressed for time? 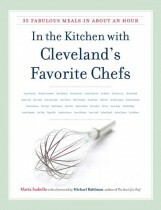 The secret’s finally out as In the Kitchen with Cleveland’s Favorite Chefs takes you into the private kitchens of 35 local culinary greats to discover what’s really cooking.